UCCFS: Ribs vs Biscuits ‘n Gravy Round 1 – I Love It Spicy! The Ultimate Chilehead Comfort Food Showdown continues. 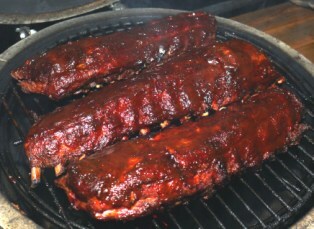 Ribs are a 4 seed and Biscuits ‘n Gravy ranks as a 13 seed, but in my humble opinion it might as well be 1 vs 1000 seeds. Ribs are succulent, sweet, spicy, chewy, addicting slabs of porklicious(and sometimes beef) goodness and they can not denied here against some lowly biscuits with pig slop on it. Whoa, I am supposed to be impartial-like ain’t I? Well, if you take the perfect flaky biscuit and coat it in the perfect savory sausage gravy, then maybe, just maybe it could be served as a side to a plate of ribs. Enough said, now go vote! That’s such an unfair matchup! Kinda like a UFC champ whooping up on some old lady with a walker! 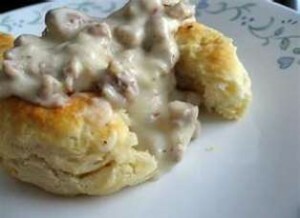 And I love biscuits and gravy! B’s & G’s with Chipotle!! A meal to die for at the firehouse! Did you have them wet or dry? You can get them either way, but I prefer them wet.